Water features are a dynamic way to add movement, sound, and interest to your landscape. Fountains, ponds or a small babbling brook can add tranquility to an outdoor living space, in addition to attracting birds and other wildlife. There are a variety of water features that go beyond the traditional koi pond, and homeowners now have a plethora of options that don’t require excess maintenance or take up too much space in the backyard. 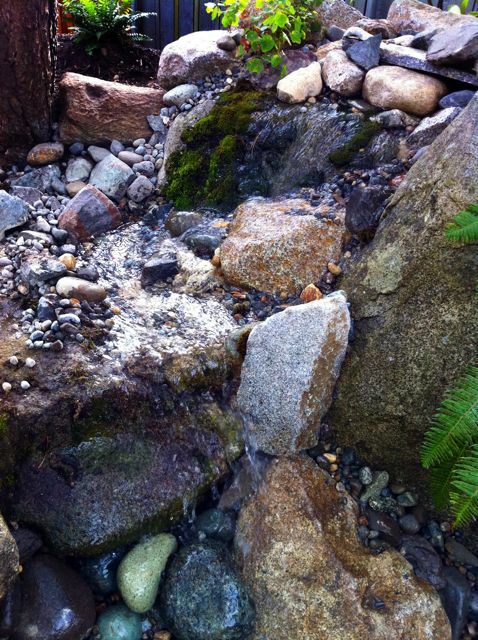 Pondless waterfalls, or disappearing waterfalls, are a great low-maintenance option, and are currently all the rage — with good reason. They allow you to enjoy the benefits of a cascading waterfall without having to deal with the excess maintenance and safety concerns associated with open ponds. No pond means no fish to take care of, no green slimy mold to clean out, no mosquitoes, and no water to refill. They’re becoming increasingly popular among our Seattle-area clients. 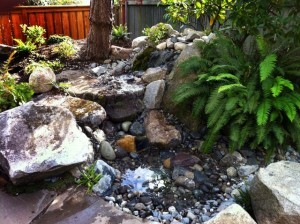 Our recent pondless waterfall project in West Seattle. So how does it work? Water flows from the upper falls, and instead of being held in a still open pond, it pours into a lined basin that is dug in the ground and filled with rocks and gravel. The water is pumped from the bottom of the basin up to the top of the falls, creating a continuously recirculating flow of water. Ecoyards recently installed a pondless waterfall at a West Seattle home (pictured above and left). The homeowner didn’t have a lot of space in his backyard, and didn’t want to bother with having to clean a pond. We created a natural landscape in a corner of his property with large boulders, small river rocks and some native plantings. 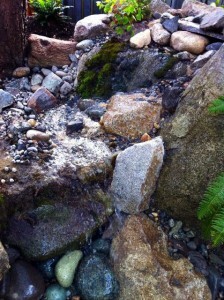 Give us a call at 206-770-7879 if you want to learn more about how a pondless waterfall might fit into your landscape. Beautiful! I love what you did.